Sweet potato noodles are tossed in a creamy peanut butter sauce with a spicy kick! Loaded with flavor and spinach, this dish will become your new favorite quick weeknight meal! Vegan and gluten-free. **This post was originally published on 3/19/17 but I updated it with better instructions on 3/23/19. This spicy Thai sweet potato noodles recipe is one of our favorite recipes that I’ve had written down in my recipe box for a few years but I just haven’t shared with you yet. I swear I wasn’t keeping it from you, it just slipped my mind until recently when I switched from making this recipe with regular flour noodles to using sweet potato noodles instead. If you love veggies and want to cut back on gluten then this is the recipe for you to try ASAP! 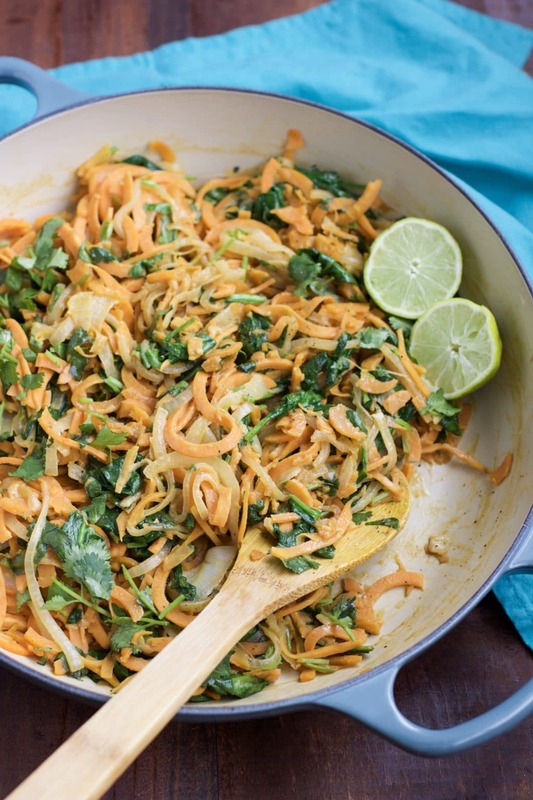 This sweet potato noodles recipe is easy to make but it’s also loaded with flavor! The sweet potatoes make great noodles because they have a hearty texture and chew that’s similar to regular flour noodles and they taste great! Just wait till you get the first bite of the sweet potato noodles tossed in the spicy thai sauce…YUM!